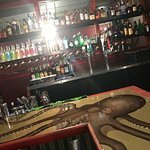 Description: Located in front of the Frederiksted Pier, Tap Deck offers draft beer, fine wines, fresh cocktails, & two pool tables, in our cozy, air-conditioned bar! Or spend the afternoon sipping cocktails on our breezy outdoor gallery, watching the bustle of the Frederiksted Pier! 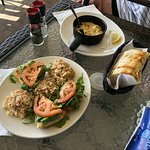 The bar menu includes small bites like our artisanal cheese selection, house-cured meats, creative flatbreads, mac and cheese, grilled cheese, soup, fondue, salads & desserts! Open 3PM-11pm daily. Emily is running a great place down on The Strand in Fredricksted! Brittney was a fun and friendly bartender, mixing up magical cocktails with my new favorite booze - Bones butterscotch rum. Yummo! The caipirinha was great as well. I went back THREE times in the same week for the poke bowl, the spicy version was perfection. The arti-goat flatbread should also get a mention since I had to snag a piece from whoever at our table ordered one. 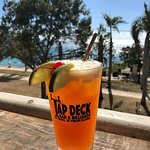 Tap Deck is a must-do when I'm staying on St. Croix. Thanks for the good times!! And darn it...now I'm craving a poke bowl!! Can someone bring one to Charlotte?? Wow, the flatbreads pizzas were excellent. The poke-bowl was perfect. I worked nearby when I lived on island, and didn’t get to visit here often enough - but when I did, it was great! They didn’t mind me bringing my kids in for dinner (when it was still early), and Emily’s shepherd’s pie special is to DIE for. Very sweet staff and good food, as well as an inviting and warm atmosphere. Can’t wait to come back and visit! We frequent this place when we are on island. The Tap Deck serves great beer, mixes great drinks and has a fantastic menu. What I like the most? Being able to walk right in and feel at home, walk right up to the bar and be greeted almost immediately! You can find your own place to sit, but you may want to get there early because this place is so popular it fills up quickly! 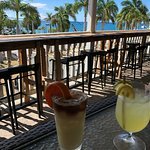 Sometimes there's great music (live bands), there is an outside veranda, and there is a great view of the scenic Frederiksted strand... the staff is awesome, the chef knows how to cook and you'll probably find your crowd hanging here!! Have fun and visit the Tap Deck!! 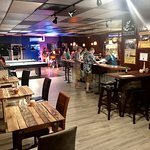 Been to Tap Deck Bar & Billiards? Share your experiences!